In the fifth chapter of Nissan's Truckumentary series on the all-new Titan pickup truck, we are taken to Alaska's winter to see how the new Titan underwent real-world cold weather testing, a critical part of any diesel vehicle's checkup. To contrast the last segment of the Truckumentary series, in which the Titan underwent testing in a clinical, warm weather setting (see that Truckumentary here), Nissan has produced a new film showing the real-world, cold weather and rough conditions testing done in Colorado, Michigan, and Alaska with the all-new Titan. These tests covered a variety of cold weather concerns and complement the durability procedures seen in the previous "TITAN Truckumentary" episode. Engineer Craig Pike notes the significance of the tests in illuminating the "kinds of things . . . we could never simulate on the track in Arizona." "There is a lot that our engineers can do behind the computer screen and in the laboratory or in the proving grounds. But you can never replicate what goes on in the real world," said Carl Phillips, senior product planning manager for the Nissan Titan. Pike and Phillips MC this edition of the Titan Truckumentary series, joined by engineers like Melaina Vasko, testing the Titan in the real world in harsh, cold conditions. The video shows the truck being put through its paces in very cold weather. This includes details such as where does snow go when the vehicle is covered and brushed off? How well do the doors, hood, etc. open after a frigid night in the parking lot? Do they do cold starts well? These questions and more, including what may not be obvious such as how long it takes for the cabin to warm up from that cold start while either idling in a driveway or on an average commute to work. This Truckumentary was filmed before the Titan was unveiled and, partially, during its unveil in Detroit in January. "Nissan has produced a new film showing the real-world, cold weather and rough conditions testing done in Colorado, Michigan, and Alaska with the all-new Titan". Hey Nissan ya missed out going to Boston, Mass. 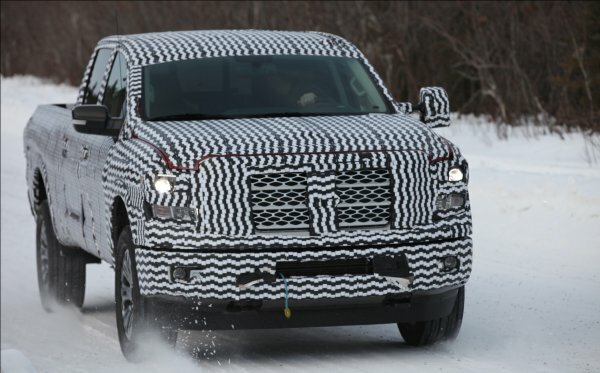 where they had a record amount of snow to test the Nissan Titan.